Show everyone how much you love the Golden State with the California Flag Morale Patch from Maxpedition. 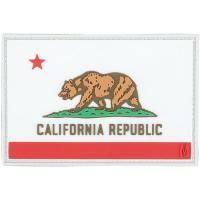 The durable PVC rubber material is printed with California's Bear Flag in bold colors and striking detail. The patch features a hook-backing that makes it easy to attach to any loop field, such as the ones found on many Maxpedition bags. The proud patch can also be sewn on for a more permanent custom look. It includes an additional loop sheet for stitching onto accessories and apparel, or can be used to protect the hook-backing when not attached to items.